Selective nerve root sleeve injections can be an effective treatment to relieve pain from herniated disks and irritated or compressed spinal nerves. They can be diagnostic and/or therapeutic in that they can be used to determine which nerve is causing symptoms, as well as providing pain relief at the problematic site. CT is now used as a guide to the injection site. No specific preparation is required for a nerve root sleeve injection, although you may be asked to fast before your appointment. Please inform us when booking your appointment if you are taking blood thinning medication (e.g. Warfarin or aspirin), as this may need to be ceased for a number of days prior to your injection. Please continue to take all your other usual medications and if you are diabetic, please adhere to your normal diet. You will be asked to lie flat on the CT table, on either your stomach or back depending on the region of the spine being injected. The area will be cleaned and injected with local anaesthetic. 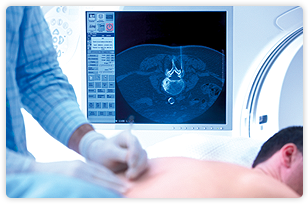 Using CT scanning guidance, a Radiologist (doctor) will carefully place a fine needle adjacent to the nerve just beyond its exit from the spine. Usually a combination of local anaesthetic and steroid solution will be injected into the site. Some patients may experience some limb pain when the needle is near the nerve. This is usually transient and will not cause any nerve damage. Complications are not common and, if they occur, are usually minor. The most significant is transient limb weakness and for this reason you will be asked to stay in the clinic for 30 minutes following the injection. Serious side effects causing permanent neurological damage are very rare. It is advisable to have someone collect you to take you home, and driving after an injection is not advised. Following the injection you will often feel numbness and tingling in the distribution of the nerve. Usually pain is very effectively relieved during the first few hours while the anaesthetic is working. It is not unusual for pain to return transiently after this. It may take several days for the longer acting elements in the injection to work. Some people do not have significant benefit from the procedure. You will be given a pain chart to complete following this injection. Please take it with you to your next doctor’s appointment. Please bring all your previous imaging with you when you come for the injection. If you have any questions regarding the procedure please contact us or speak to your doctor.